A simply gorgeous shot of Au Sable Point and the Au Sable Light Station in the Pictured Rocks National Lakeshore. View this photo background big on Twitter and definitely follow John on Instagram! As predators, northern pike can have significant impact on their prey species. As with muskies, pike lurk in the cover of vegetation in the lake’s clear, shallow, warm waters near shore, although they retreat somewhat deeper in midsummer. Pike consume large numbers of smaller fish – about 90 percent of their diet – but seem willing to supplement their diet with any living creature their huge jaws can surround, including frogs, crayfish, waterfowl, rodents, and other small mammals. Their preferred food size is approximately one third to one half the size of the pike itself. Great Lakes pike spawn in the shallows in April or May, right after the ice leaves, and before muskies reproduce. As a result of their eating habits, young pike grow rapidly in both length and weight. Females become sexually mature at age three or four years, and males at two to three years. Beyond sexual maturity, pike continue to gain weight, although more slowly. Great Lakes pike have an average life span of 10 to 12 years. Pike eggs and new hatchlings (which stay inactive, attached to vegetation for their first few days of life) fall prey in large numbers to larger pike, perch, minnows, waterfowl, water mammals, and even some insects. Larger pike have two primary enemies – lampreys, and man. Spawning adult northern pike, exposing themselves recklessly in the shallows, are vulnerable to bears, dogs, and other large carnivores. Northern pike flesh excels in flavor, thus making them a doubly rewarding game fish. Since their skin has heavy pigmentation and an unappetizing mucous coating, most people skin them or scale them carefully. This photo was one of Isle Royale National Park’s “Wildlife Wonders of the Week.” They noted that a five pound female pike will lay about 60,000 eggs. Two weeks later fertilized eggs hatch, hungry for microscopic morsels. Once to the fingerling stage, food scarcity may force them to eat their own siblings for nourishment. View it bigger on Facebook and definitely follow their page for the latest from one of Michigan’s coolest parks! More Michigan fish on Michigan in Pictures. Up to 152 miles (245 km) of coastline in lakes Huron and Michigan could be fouled by a single oil spill at the straits, according to the simulations. When all 840 simulated spills are plotted on a map, a total of 720 miles (1,162 km) of shoreline in the U.S. and Canada are considered potentially vulnerable to spills that would require cleanup. Seven hundred twenty miles is roughly the distance from Detroit to Atlanta. Areas at highest risk include Mackinac and Bois Blanc islands, as well as locations directly east and west of Mackinaw City. Communities also at risk include Beaver Island, Cross Village, Harbor Springs, Cheboygan and other places along the lakes Huron-Michigan shoreline. View Sandy’s photo bigger, see more in her aerial slideshow, and follow her on at Sandy Hansen Photography on Facebook. A U.S. Department of Homeland Security report indicates a 6-month shutdown of the Poe Lock in Sault Ste. Marie, if one occurred, would plunge the nation into recession, closing factories and mines, halting auto and appliance production in the U.S. for most of a year and result in the loss of some 11 million jobs across the nation. The report, obtained by the Free Press through the Freedom of Information Act, paints a grim picture of the outcome of any long-term shutdown of the Poe, the only one of the so-called Soo Locks able to handle the 1,000-foot-long vessels that each year move millions of tons of iron ore from mines in Minnesota and northern Michigan to steel mills dotting the lower Great Lakes and beyond. ….But what is also clear from the Homeland Security report is that while a longer-term shutdown would be catastrophic, even a shorter one could have a much wider impact than previously thought: If such a closure occurred at the Poe during the March 25-Jan. 15 shipping season, for instance, as much as 75% of the nation’s steel output could be halted within two to six weeks. Read on for more, including a video of a ship going into the locks. View twurdemann’s photo from Engineer’s Day (every June) bigger and see more in his Great Lakes Shipping slideshow. More Soo Locks on Michigan in Pictures! When scientists discovered six years ago that aggressive Asian carp had made their way up the Mississippi River’s tributaries toward the Chicago area, the Obama administration and alarmed state officials pledged swift action to head off an invasion they feared could devastate fishing and boating on the vital Great Lakes. Since then, federal agencies have spent more than $300 million on stopgap measures, including placing electric barriers on one likely route, a shipping canal that leads to Lake Michigan. But as the carp get closer_some are within 80 miles of the lake— the quest for a surefire deterrent seems to be coming up empty. An advisory panel that has debated solutions for several years is scheduled to hold what may be its final meeting Thursday, with no sign of a consensus plan, several members said in interviews. Even if talks continue, chances are growing that the carp will arrive before anything conclusive is done to stop them. At their recent pace, the first young carp could reach Lake Michigan within two years, although a number of obstacles could slow them considerably. …Environmental groups and the region’s fishing and boating industries, which generate $23 billion annually on the lakes, are most worried about two varieties of Asian carp: bighead and silver, which weigh dozens of pounds and gorge on the same tiny plant and animal life that feeds the lakes’ other fish. Scientists are still measuring their impact in rivers, but under worst-case scenarios, the large carp could leave popular sport fish to go hungry and suffer population drop-offs. Asian carp are edible but bony, and most Great Lakes fish connoisseurs regard them as a poor substitute for the walleye and whitefish. Additionally, silver carp are notorious for springing from the water when startled, sometimes ramming boaters with bone-cracking force — a hazard that some fear could damage the Great Lakes’ tourism industry. Read on for much more, and be sure to follow John on Twitter for more of the story. And please, make it clear to every elected official you interact with how important the health of the Great Lakes is to Michigan! More about the threat of Asian carp on Michigan in Pictures. 25 years after their discovery in the Great Lakes, “we’re not documenting specific harms from gobies,” Popoff said, referring to feared environmental, economic and human health concerns. In fact, there are indications of possible benefits from their presence, he said. For example, “we are seeing amazing smallmouth bass,” as well as some “amazing walleye,” while lake trout have modified their diets from sculpin to round gobies. One possible exception, according to Popoff, is a decline in sculpin population as documented in Lake Michigan’s Grand Traverse Bay because they compete with round gobies for space and food. However, scientists haven’t determined whether the lake’s overall sculpin population is down or whether they’ve merely moved to deeper areas with fewer round gobies. In lakes Erie and Ontario, round gobies accounted for 75 percent of the smallmouth bass diet, Crane said. If all other species have maintained stable populations, that means the bass are putting less pressure on other food sources. 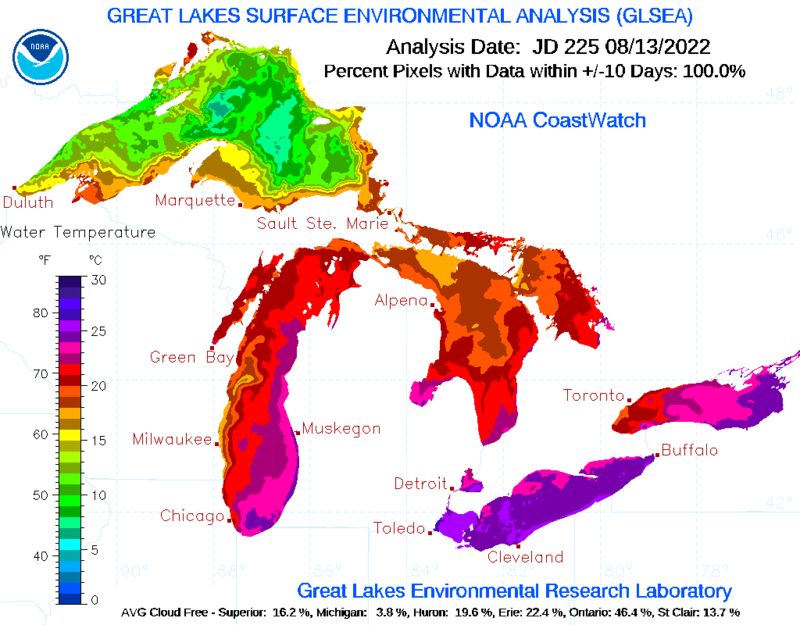 Nice to see the Great Lakes winning a battle – read on for lots more. View the photo background big and see more in Michigan Sea Grant’s Aquatic Invasive Species (AIS) slideshow. The NOAA Great Lakes Environmental Research Laboratory is showing total ice cover of 84.4% as of February 22, 2015, well above the long term average and closing in on last year’s mark of 92.5% coverage on March 6, 2014. In this image, Lake Erie is a vast white plain, joining Lake Huron and Lake Superior with coverages above 90% and only small areas of open water. This image was taken by the Suomi NPP satellite’s VIIRS instrument around 1803Z on February 23, 2015. Click through to see it big as the Great Lakes and see more photos of the Great Lakes from high above if you click the “Great Lakes” keyword. PS: Follow @NOAA, @NOAA_GLERL & @NOAASatellites on Twitter for lots more great images!